Sure predicting matches looks easy, but Turnbuckle Radio hosts Brian and Trevor are proving it’s far more difficult than it looks. TREVOR: Once again, The Miz loses his time to shine in the pre-show (WHATEVER SHALL HE DO!!). In an attempt to make 3MB and Los Matadores relevant, this match was concocted. Is there any way Drew McIntyre can escape this nonsense? Probably not. Have to assume El Torito takes this one, with the high probability of tom foolery. TREVOR: It’s a shame the WWE has no clue how to use Xavier Woods, a simple one-on-one battle between him and Rusev carrying forward from NXT would have sufficed as an angle but nope we have to include the aging, tiring R-Truth. Eventually Woods has to break away from this guy or else he risks purgatory amongst disinterested members of the WWE Universe. Brian and I are both expecting a huge squash here, Rusev CRUSH! TREVOR: You have to be happy about this one — an actual women’s wrestling match! These two are poised to put on a great show. I have a lot of respect for Tamina but Brian and I both agree that’s it just too early for Paige to drop her title. Should be a great match though. TREVOR: I like that this match has been made into an Elimination match — it can go a lot of different ways. Something tells me Paul Heyman and Zeb Colter aren’t done — not by a long shot — so I expect their rivalry to go past the Extreme Rules PPV. I foresee Swagger getting pinned first by Cesaro, prompting a series of great exchanges between RVD and the King of Swing. But Swagger will find his way back into the fold to screw over Ceasro, both giving RVD the win and furthering the Real Americans’ angle. BRIAN: Now this has the potential to be a great match. Three guys that aren’t afraid to work, and a good mix of the high-risk taking RVD with his stronger, more technically proficient opponents. Swagger and RVD are comfortable settled into the middle of the card right now, Cesaro’s trying to take the next step. TREVOR: The IC title tournament was a nice touch and provided a great platform to elevate mid-card names and the IC tittle itself. The Tournament was 50/50, some greta matches were had and others were used to push other rivalries (ie. RVD/Cesaro/Swagger). The WWE’s clear disdain for the IC Title is borderline insulting. Initially, I had high hopes for Big E’s title run but like championship runs before his, including Barrett’s, the WWE failed miserably at establishing long-term, meaningful rivalries. Big E is one hell of a specimen and I hope he and Barrett put on a great match here but a change of scenery couldn’t be more needed. BRIAN: Big E’s title reign has been a disaster, and not necessarily by any fault of his own, just awful booking. Barrett is a star on the rise, so WWE has a chance to do good things here: elevate BNB to the next level, and push the restart button on the title (again) and try to restore some of its lustre. BRIAN: This match has had the best build, not just of this PPV, but dare I say any PPV all year. Fantastic promos by both guys, and I was legit creeped out by the children wearing goat masks on Raw. It’s rare that, ahem, seasoned wrestling fans such as ourselves are affected as such. The brilliance of Bray Wyatt’s evil is that it’s not based on brutal beatdowns – it’s based on him messing with your mind. No wonder he’s been so effective. Anyway, the match? Steel cages are always good times. Cena got the win at Mania, I think Wyatt gets one here, and we get a rubber match next PPV. TREVOR: For anyone who watches NXT, Bray Wyatt’s brilliance should not come as a surprise. He was stellar then and he’s found a way to become even better now. For all of WWE’s failures at pushing mid-card guys, Bray Wyatt and Harper/Rowan have been a massive success. Wyatt’s skills on the mic are unparalleled. His promos are unique and theatrical. And his in-ring work is devastating and equally entertaining as his promos. Cena has done a great job in using his experience to elevate Wyatt, and while he got his win at Wrestlemania I can’t see him getting it done tonight. I’m not sure if this rivalry goes on past this PPV but I wouldn’t be upset if it did. Either way, Wyatt will get it done. TREVOR: Kane’s triple tombstone to Bryan an Raw a couple weeks back was the highlight of this story moving forward. Unfortunately, we’ve all had to suffer through Stephanie’s involvement, and I assume she’ll rear her ugly face at some point in time in this match — if anything to have Brie slap her. 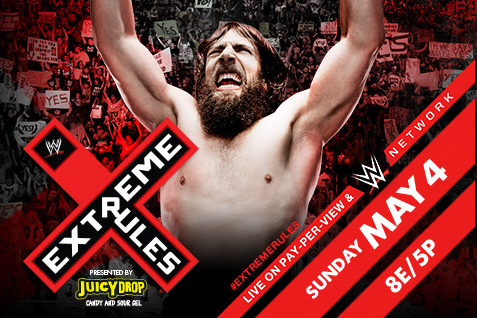 The match itself should be decent, as Extreme Rules matches generally are. But there is no doubt who the winner will be — none. Bryan will win a hard fought, possibly bloody match, and move on to feud with someone more meaningful. BRIAN: The build towards this has been so riddled with clichés, almost as much as how contrived Kane’s return to his old ways have been. This is nothing more than a stopgap feud for Bryan on what should be a long title run. Kane winning would be nearly as shocking as his brother losing at Mania. BRIAN: Should be a great match with some crazy spots. You’d have to think the rising superstars from the Shield win, but I wouldn’t mind seeing Evolution come out on top and extending the feud longer. I don’t know if WWE’s intentions are to keep Evolution 2.0 together for a while, but if so, my hope is they add a fourth member to fill the currently vacant “future” role in this faction. And wouldn’t it be awesome if said individual debuts tonight to help Evolution win? TREVOR: As soon as Batista came back, I was skeptical on how long he would go for. It looks as though he’s ready to go on vacay again here soon to promote his upcoming Marvel film, but I don’t see that affecting the outcome of this match. What would be interesting would be to have Batista get ‘injured’ or beat down and have Rollins and Ambrose turn on Reigns and join Evolution as the future of the franchise. Batista goes away, and HHH and Roman Reigns begin their natural progression towards a match at Summerslam. It’s all extremely circumstantial (see what I did there), but it would be interesting. Although how hilarious would it be if Bo Dallas got involved to join Evolution? BO-lieve in Evolution!! !